elcome to K*S, or KnoxSites' professional Web site developing site. We're here to bring you with the most customized and visually appealing sites, such as the one you are viewing now. Here are KnoxSites, we are dedicated to bring you with the most compelling and intricate Web designs. While we boast friendly personnel and intricate Web designs, KnoxSites also delivers appealing and easy-to-navigate Web sites. By designing an easy-to-navigate Web design, this allows a surfer to quickly and efficiently view your company or organization's information. In turn, this pleases the viewer and are more likely to invest in your company's business. This is one of the beauties of the World Wide Web. Establish your Web presence today! "I absolutely love the intricate and user-friendly design that you people have given my site. Without a doubt, you are the best organization for a small business site! I'd encourage anyone to start their Web presence with KnoxSites!" We specialize in colorful and graphic Web sites! Why choose us? K*S designs has been serving happy people for over one year. Our highly-trained and friendly personnel will work hard to design the site you want. 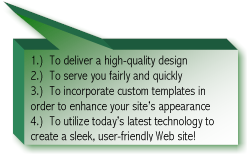 We design "templates" without any content that show what your site will look like. After you approve of the design, we will customize it and add your content and images. Click here to learn more about Web designs. Now's a great time to get a sports site designed! Click here to learn more about Web site designs by KnoxSites. We can set up a typical Web site within 3-4 days! You are the to this site since 6/7/02.